Ambushed [in a good way]. The Ambush Gallery have really got it going on.. All their digits are on the pulse. I recall going to their shows in Waterloo years ago and look at them now. Amazing! Nice one, guys. They housed a sugar festival and the opening of a world class stencil exhibition last weekend. Yes, we’re a tad tardy on the diary entry however we blame the hangover from the mega dizzying sugar rush mokay? And it was worth it by the way. Admittedly a little excited, we skipped breakfast in anticipation of all the offerings at the Sweetfest event that was part of the Good Food Month. Upon arrival we celebrated with a glass of sparking from Redbank in hand, wandering and exploring what was on offer. We eventually found ourselves tucked in the corner scoffing sweets, sipping bubbles and allowing the go-go-gadget-arm to extend out to the stalls to bring back more. Incidentally, did anyone have the s’mores from Andy Bowdy Pastry [FYI you guys need either a hug or a smack as these were to die for!]. These were a ‘high’light. Our favourite masterclass was from Alistair Wise from Sweet Envy in Hobart [we love Hobart!]. He’s highly entertaining and super talented! And he’s a little evil… He created a gutter trash sundae that was 2.4m long. My teeth almost fell out looking at it. Suffice to say they stayed put and it was a taste sensation. The crescendo was the fantastically fizzy champagne fountain spider experience! This guy knows how to have fun. So I discovered that sparkling wine and sugar make for an interesting burst of unexpected energy. Admittedly I was a little tongue tied from the rush however eager to hop, skip and bounce across the living mall to the Stencil Art Prize. This exhibition is in its seventh year and features 92 artists from 21 countries. There are some wonderful pieces. Make sure you check it out before it wraps up this Friday, 30 October. Our pick? Robin Williams of course. We miss you, oh talented creature. 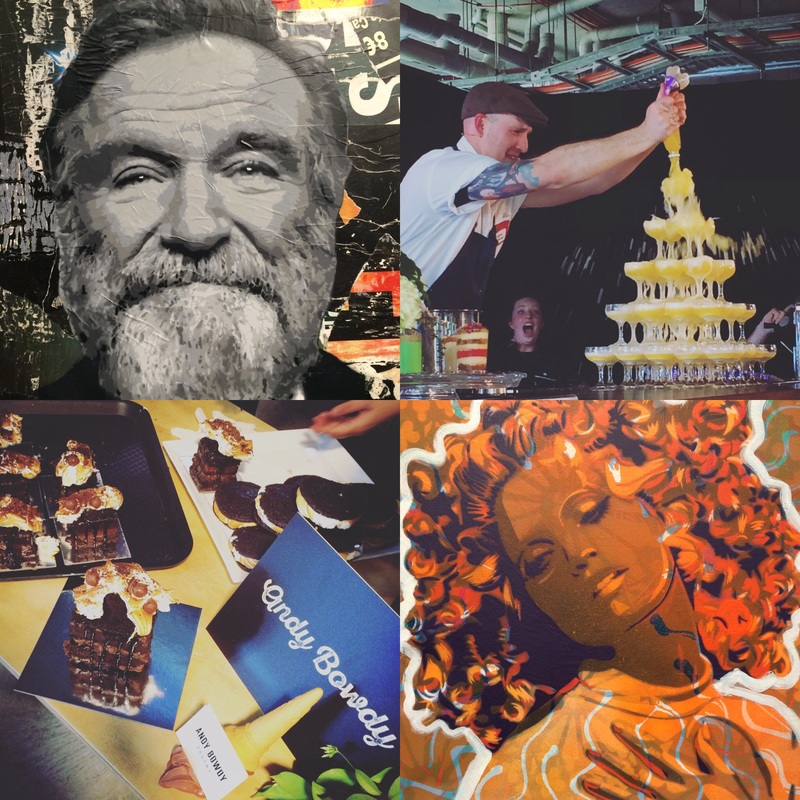 Sweetfest and Stencil Art Prize. PC: getfunkt on instagram. Don’t touch, and definitely DON’T lick! The latest offering at the Brenda May Gallery on Danks Street is the ‘Untitled Show.’ The exhibition theme is based on creating an opportunity for the viewer to have their own personal thoughts and interpretations of each piece’s meaning. There are 15 artists in total. We immediately gravitated to Al Munro’s piece in the back corner. I’m not even there anymore and I’m salivating again. No prizes for guessing which piece it is below. Those wonderful colours are bright, fun and bring on a sense of nostalgia. Munro is currently working on an arts/maths fellowship and often uses scientific and mathematical data as a starting point for her creations. We also loved Jim Croke’s work. Jackson Pollockish however painted with such precision one would think a fencer was called in and their sabre used to complete the canvas. Croke teaches at the NAS and is well known for his sculptures. Lastly the car with overflowing baggage is Todd Fuller’s creation. We giggled, what a nice piece reminding us that we all have too many things. Fuller is multi disciplined, having his paws in various pots working on illustration, painting, performance and his hand drawn animations were awarded with an honourable mention at the 15th Asian Art Biennale (2012). Nice work! The show runs until October 24. The ‘Untitled Show’ at the Brenda May Gallery. Free your mind, my art will follow. After a spontaneous trot on the weekend to the Moore Park Gardens for a quick hit of sun soaking, we decided to hop into Black Penny to quench the thirst.These guys host art shows in the back of the bar and the exhibitions run from one to two weeks. With gin in paw, we wandered out the back to see the latest offering and we were instantly drawn to the vibrant colours and the playful execution of the pieces. 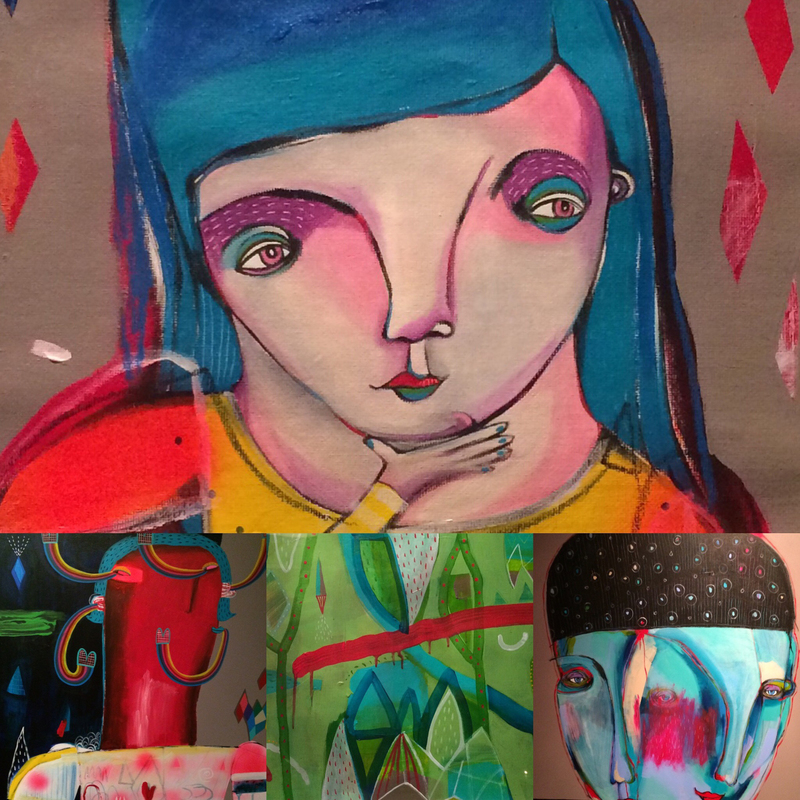 Angie Soto is a Sydney based artist who’s used acrylic, spray paint and mixed media in this solo show. And we have to say we love her style, vibrant, quirky, Picassoesque at times and others surreal. Hop down as the show is on until October 13. Saturday was a spectacular day! Why? Because we almost faint with excitement with anything geometric. 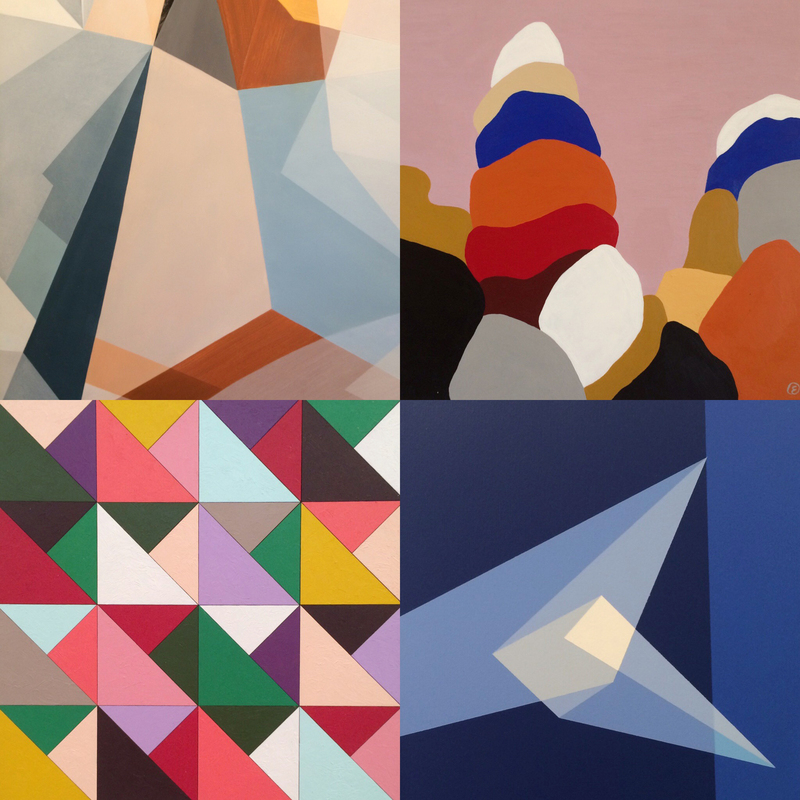 We popped into the Geometrica show at the Mild Manners​ gallery. This is our first visit to the gallery and it’s lovely. You hop through a book/records store and up the stairs to an light and airy space. We particularly love the hues of the pink coming through the back window. Yummy. It was great to have a chat to the curator, Amber Creswell Bell, who puts on about 4 shows a year. Congrats to you and the artists! Better get in quick as there are only 3 days left to catch it. This Thursday to Sunday, at 1/499 Crown Street, Surry Hills. Artists in the snap are @genevievefelixreynolds @emmalipscombe_ @evi_o @liamsnootle on insta. Flowers and People Cannot be Controlled but Live Together. 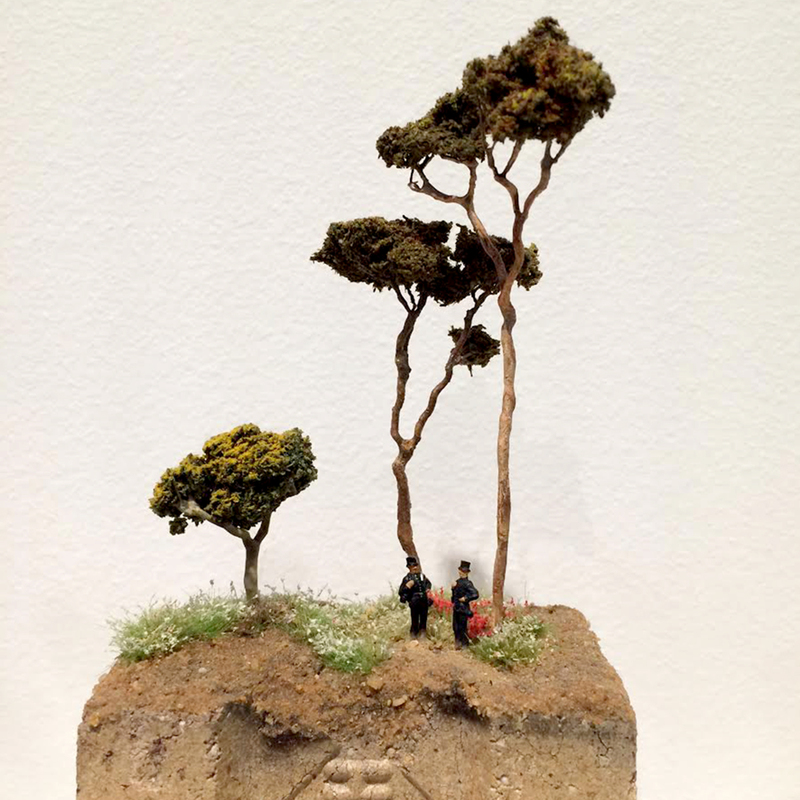 In our lovely little gallery hop on Saturday we discovered this sweet gem at Martin Browne Contemporary in Paddo. 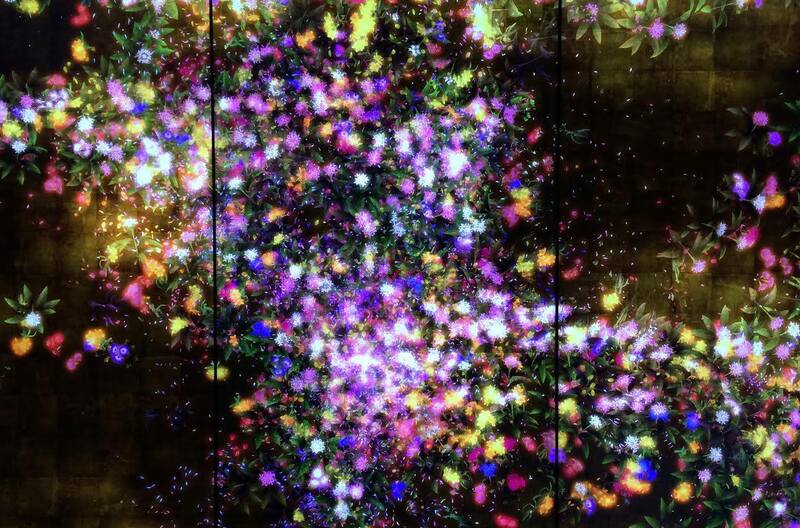 This interactive digital installation is called Flowers and People Cannot be Controlled but Live Together by teamLab. The flowers grow before your eyes from bud to bloom then the petals float away leaving the flowers to fade. The viewer interacts to start or end the process. Watch a larger scale installation here in action. Beautiful and tranquil. Saturday was an absolute cracker of a day so we opted for sunny art gallery hop in Paddo. 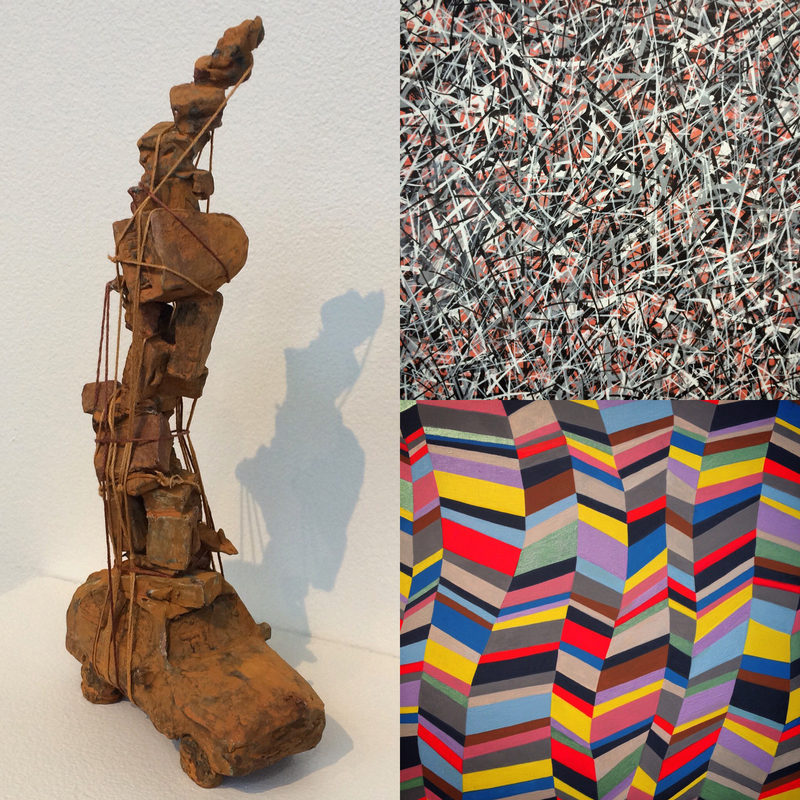 We headed to the Roslyn Oxley9 Gallery​. And boy was it delicious. We caught ourselves licking our lips. 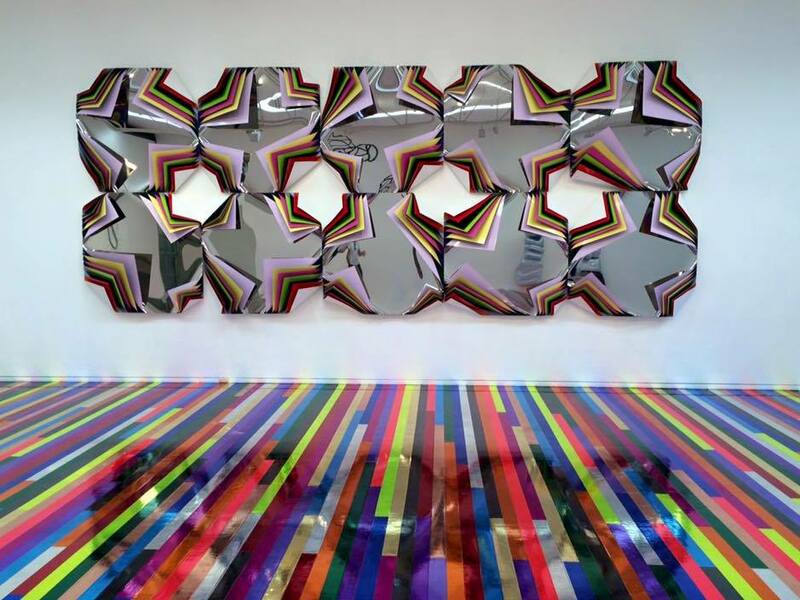 Jim Lambie’s work is tantalising to say the very least. And quite frankly we want those floors to pave our paths with every step we take. The show runs until September 26. The Archibald Prize is free for ANZ customers this weekend. You’re Wynning [I know, another dad joke!] if you are an ANZ customer entry is FREE for the whole weekend to see the Archibald, Wynne & Sulman prizes this weekend at the Art Gallery of New South Wales. Off you go then! We LOVED Karl de Waal’s submission. What are your thoughts on these miniature masterpieces? Take me to Spice Alley! moneymofo on Top ten culture kicks! onceuponanape on Top ten culture kicks! moneymofo on So 9, so good! Kim Tran on So 9, so good!